Multiple police officers were shot in Baton Rouge, Louisiana, on Sunday morning after an incident near a convenience store on Airline Highway. Officials reported that at least three local police officers were killed and three others injured, in a city that has already suffered greatly from tensions between police and civilians in the last two weeks. Although it's still too early to know all the details of the situation, it's not too early to help the Baton Rouge officer shooting victims. Clashes between police and civilians have left forces in many cities on high alert lately. In Baton Rouge, police shot and killed 37-year-old Alton Sterling earlier in July. Near Minneapolis, Minnesota, an officer shot and killed 32-year-old Philando Castile just a day later. Shortly thereafter, five Dallas police officers were shot and killed by a gunman, likely in response to the earlier police shootings. Protests have occurred across the country in the wake of such incidents. Around noon on Sunday, there was no word whether or not Baton Rouge's police shooting was in some way connected to the previous incidents. Regardless, it's a tragic event that comes at a time when relations between police and their communities are largely tainted by instability. That instability will likely remain for the time being, but supporting the victims of Sunday's shooting and their families is nonetheless a step in the right direction. On Sunday, at least one GoFundMe page was set up in response to the attack on police in Baton Rouge. A GoFundMe user named Tyler Anthony Bennett of Baton Rouge created the fund to honor the fallen officers and his family's connection to the department. "I come from a family of police, my father is employed with the Baton Rouge Police Department. I can't even start to imagine the emotions from the families of the fallen officers," he wrote on the page. Bennett set his fundraising goal at $80,000, but he did not specify how the money would be donated. Additionally, nonprofit group Planting Peace launched a CrowdRise fundraiser to support the affected police officers and their families. "Although we have so many issues in our country that need to be addressed, random acts of violence and murder should never be seen as the answer," the group wrote on its CrowdRise page. The page did not specify how the money would be used or given to the officers' families. Several nonprofits across the country are dedicated to honoring fallen police officers. 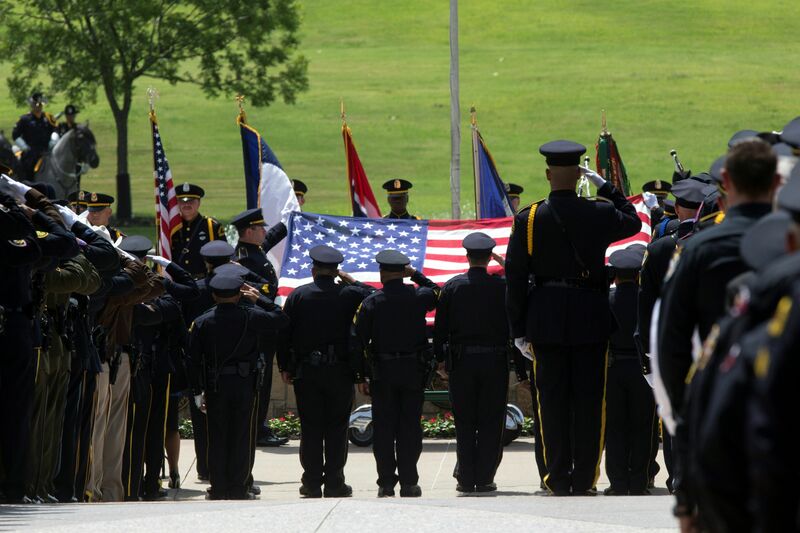 The National Law Enforcement Officers Memorial Fund uses donations to hold vigils and memorial events, conduct research, and promote police officer safety programs, among other things. Similarly, the Officer Down Memorial Page, Inc. raises awareness of police officer deaths, advocates for harsher punishments for those who carry out violent acts against officers, and more. Although neither of these organizations are specific to the Baton Rouge police force or the victims of Sunday's shooting, they contribute to police forces on a larger scale. Following the police shooting in Dallas, a petition popped up on MoveOn.org that asks Congress to ban assault-style weapons like the ones used in the Texas attack on police. As of Sunday, the petition had 74 signatures — 26 signatures shy of its 100-signature goal. Like the organizations above, the MoveOn.org petition is not specific to Sunday's attack in Baton Rouge, but it aims to serve police in a broader sense. After shootings, it has become common for people looking for ways to help to seek out blood donation centers. Lines snaked around blood donation centers in Orlando, Florida, after the recent shooting at a gay nightclub there and in Nice, France, after the tragic terrorist attack there last week. If you feel compelled to give blood after Sunday's shooting, seek out a local donation center, like a Red Cross affiliate, in your area. The shooting in Baton Rouge is just the latest instance of gun violence — and violence against police. Clearly, there's plenty of work that needs to be done across the country to put an end to the violence. Donating money, contributing to a petition, or giving blood may seem like small steps, but they're certainly valuable when taken as a whole.